There was plenty to like about this metal shed with a pent roof and contemporary styling. The first thing that stood out for us is its price for a durable storage facility that’s ready for a timber floor. While the timber for a floor isn’t included itself, a timber support kit is. That makes it a great choice for consumers who are working to a tight budget, yet prefer the look and feel of a wooden floor. There are two kinds of protection that any metal shed needs in our country: protection against rain, and protection against the weather. The pent roof gives the first line of defence against the weather, and is then backed up by the galvanised steel used for the body of the shed. 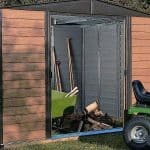 These factors not only stop rain from entering the shed itself, they also discourage the appearance of rust, so you’ll keep the attractive zinc effect for longer. There are no windows in this shed, which can be an automatic deterrent to opportune thieves. It’s a pity that a padlock wasn’t available as standard, or as an official optional extra, although the sliding double doors do come with holed handles that are tough and padlock ready. 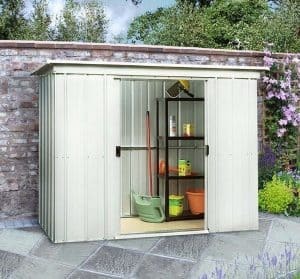 This metal bodied pent shed is designed to give a high quality, durable, storage space for smaller gardens. The first thing we noticed is that the shed is considerably wider than it is narrower, which instantly made us think of how it could be used to store wider objects. As it’s constructed from non-flammable metal, it could potentially be used as an all-weather store for a motorcycle, although additional security measures would need to be put in place if it was being used for that purpose. The pent roof features a shallow slope, which is enough to carry water away without creating an obtrusive ridge. The use of a pent, as opposed to an apex, roof also allows the costs to be kept down for the consumer. With a peak height of 1.74m, and an eaves height of 1.60m, the headroom available within the shed is strictly limited. The extra width offered, however, means that even taller pieces of equipment can be stored on their side. The overall width of the shed is 2.38m, and the overall depth is 1.19m, making it exactly twice as wide as it is deep. Keep this in mind when looking for a suitable spot to install it. When constructing the shed we were concerned that the thin and lightweight nature of the cladding would mean that it would be flimsy, which can turn into a problem during adverse weather conditions. Once fully assembled, however, we found that it was strong and sturdy. One factor in this is the hot dipping galvanisation that’s been used to increase the toughness and rigidity of the 0.35mm steel. This creates a zinc plated finish which has then had a clear resin coat added to give even better resistance to rain. This means that the cladding gives excellent protection against all kinds of weather, but it has one other advantage as well. If you live in a rural area then you’ll know how wooden sheds can be susceptible to rodent attack, resulting in unsightly gnawed corners. We’ve also seen sheds filled with tiny holes that are caused not by woodworm, but by wasps. The metal nature of this shed provides protection against both of these threats. There are two flooring options. For ease of use, we would recommend installing it onto a level area of concrete using the anchor kit provided. 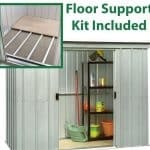 Alternatively, there is also a floor support metal frame kit which allows a wooden floor to be laid. Because this elevates the timber above ground level it creates a drier and warmer floor, and reduces the risk of rot being caused by rising moisture from the ground. 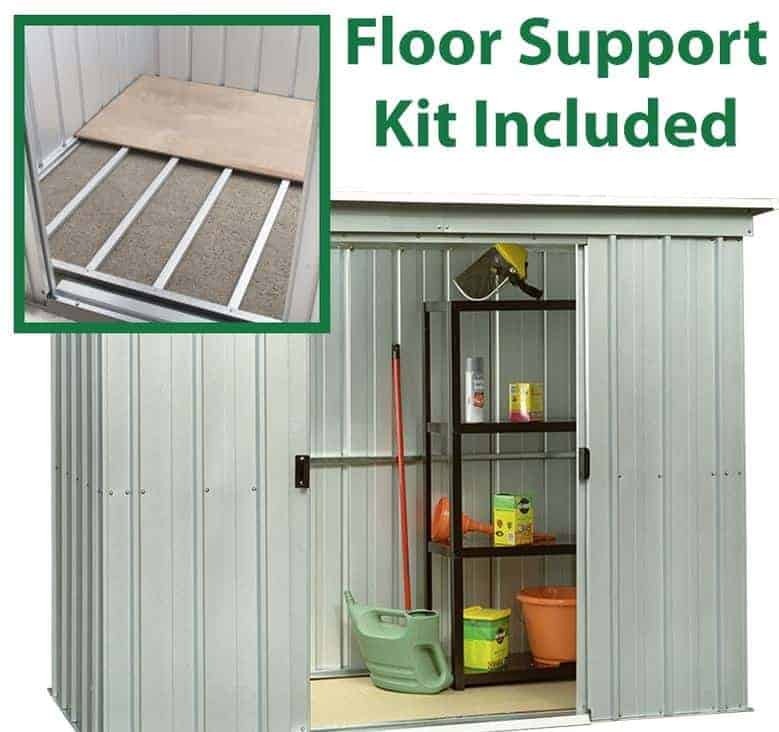 There is no treatment required for this shed in its basic form, although if you do install a timber floor it will be important to treat that component with wood preserver on a yearly basis. Yardmaster have supplied a 10 year guarantee against perforation caused by rust, which is a feature we welcome, but having seen the quality of galvanised cladding used we feel it could have been even longer. We loved the easy access that the sliding doors provide, although we would have liked a taller shed and taller door so that we didn’t have to bend down so much while entering and exiting. The doors are an attractive feature, helped by the internal setting that hides the mechanism away. Their width of 1.02m was very accommodating for everything from a lawn mower to a bicycle, but the height is only 1.55m. As the shed has a window free design, you may want to have a torch or light source near to the entranceway, although the sliding doors help to light the interior when open. 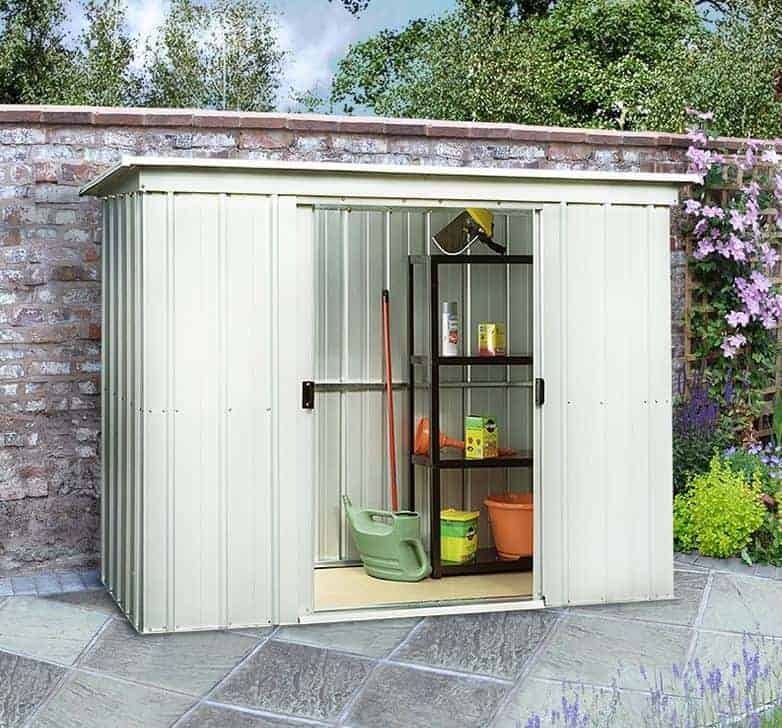 Because of its wide opening and easy accessibility, it’s tempting to want to store more valuable pieces of gardening equipment in this shed. That’s why we would have liked to see a padlock included as standard, although we were pleased to see that the shed is padlock ready. On a positive note, both the internal fitting of the doors and the lack of windows help to boost security, cutting down on potential access points for intruders. Whilst we really liked the excellent flooring support kit that comes as standard, the timber itself isn’t. That means you’ll have to source suitable wood yourself. Keep in mind that it will have to be tough, resilient and resistant to rot. Decking boards make a perfect choice for this role, particularly if they’ve been tanalised to give them an initial preservative coating. 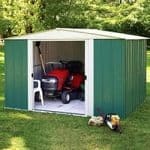 The fabrication of the components in this shed was of a very high quality, a quality which is evident upon first sight. The manufacturer has provided a 10 year guarantee against damage caused by rust, but we feel the galvanised frame covered by a clear resin should outlast this. 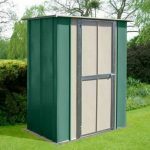 We liked the wide front that this shed has, particularly in conjunction with the wide opening double doors, but the restricted height impacts upon the overall storage capacity. The instructions were clear and easy to follow, and because all the fixtures and fittings are included it took two of us around five hours to complete the installation. 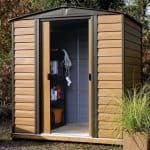 At just over two hundred pounds, we feel that this shed represents good value for money, particularly with the inclusion of the timber floor support kit. 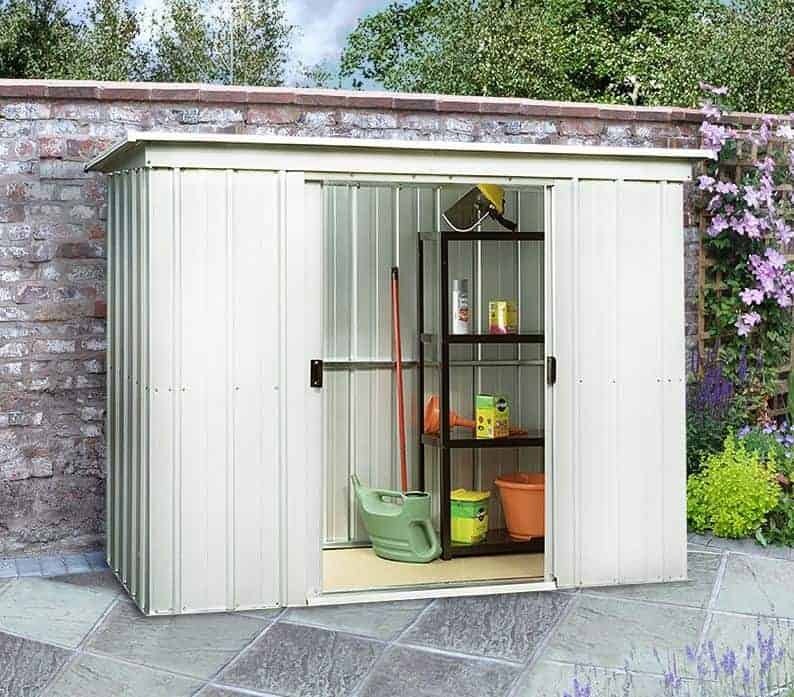 Final Thoughts: This certainly isn’t the tallest shed, but its wide front allied to a shallow depth will make it the perfect choice for some shorter gardens, and the wide double doors mean that you can easily get objects in and out, thus making full use of the storage available. We particularly liked the inclusion of the timber floor support kit, meaning that customers can select whether they prefer a concrete or wooden floor. 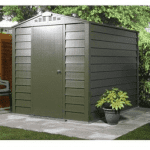 Everything about this shed is designed with waterproofing in mind, from the pent roof to the rust resistant screws, so even though the warranty is only valid for ten years, you may find it lasting longer without the appearance of rust.